I drove out to Kananaskis today to visit the mountains. It's been a while since I've been able to get out and hold my camera in my hands and make some photos. I picked up some snowshoes on Friday and was wanting to try them out. In my research there are lots of cross country ski trails, but there aren't that many official snowshoe trails around. 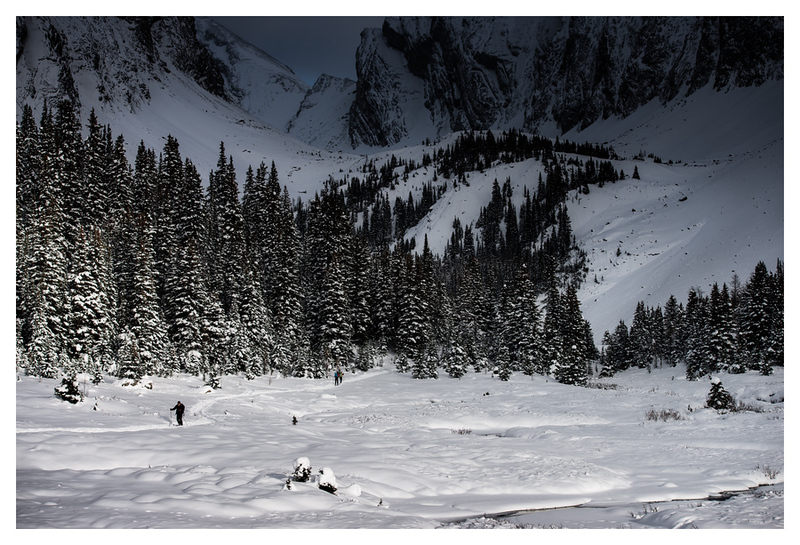 Chester Lake has some snowshoe trails and had received quite a bit of snow last weekend. I'd been up there recently for fall photos so there is where I wanted to go. In regards to snowshoeing, I imagined to some degree that having snowshoes would allow me to float on top of snow and that somehow it would be this frolic-y "bound through the snow with a big smile on my face" kind of experience.. however as it turns out, snowshoes aren't wings, nor are they anti-gravity shoes. They do help distribute your weight over a larger surface area so you don't sink as much on packed snow and all the jagged teeth on the bottom of the shoe gives you a certain amount of traction but magic carpets they are not. A hill is still a hill regardless of what you have on your feet and a hill must be climbed and gravity overcome in order to scale it. I got to the Chester parking lot and started gathering my stuff for the hike. It didn't take long before I spotted the moose. There were four of them in the parking lot and they were going around and licking cars presumably to get the salt. 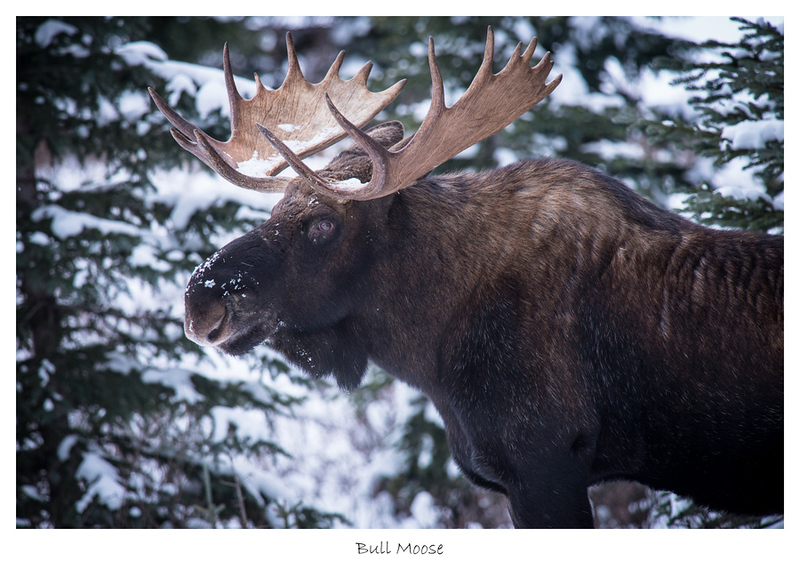 Moose are quite tall and lanky looking so I was surprised when they moved and showed how nimble and graceful they actually are.. I was trying to position myself so I could get a photo of a young male - without a car in the background - when some skiers came zipping off the trail and into the parking lot. They spooked the moose a little bit and it bound off into the trees. At this point I decided to leave the moose alone and start off on my journey to the lake on my fancy snowshoes. It didn't take too long before I needed a rest. I wasn't pacing myself very well and with my unrealistic expectations at how easy the snowshoes would make this - I had run out of breath. I rested and after a bit started up again and quickly was tired again.. then I started to sweat - a lot.. which seemed OK because I had a number of layers on including some sporty shirt that is supposed to whisk sweat away. I unzipped my coat and continued on for a bit until I needed another rest. In reading about snowshoeing I learned that the proper etiquette is for snowshoe-ers to stay off the ski tracks so I was trying to go on the side but the snow was loose and deep and it was hard work to walk through this kind of snow. Hence all the sweating. The trail to Chester lake eventually flattens out once your in the upper valley. When I finally got there I was excited to see that the light was very beautiful. The clouds were blocking the sun from hitting the upper mountains so there was this nice bit of sunshine hitting the ground but there were shadows up above on the mountains. In addition there was snow blanketing the ground providing a lot of nice textures. Once I got to the lake itself I found it was covered with snow and ice. I was hoping that there might still be open water for some reflective photos, but no such luck.. I followed some tracks around the lake that eventually led up into the trees again. 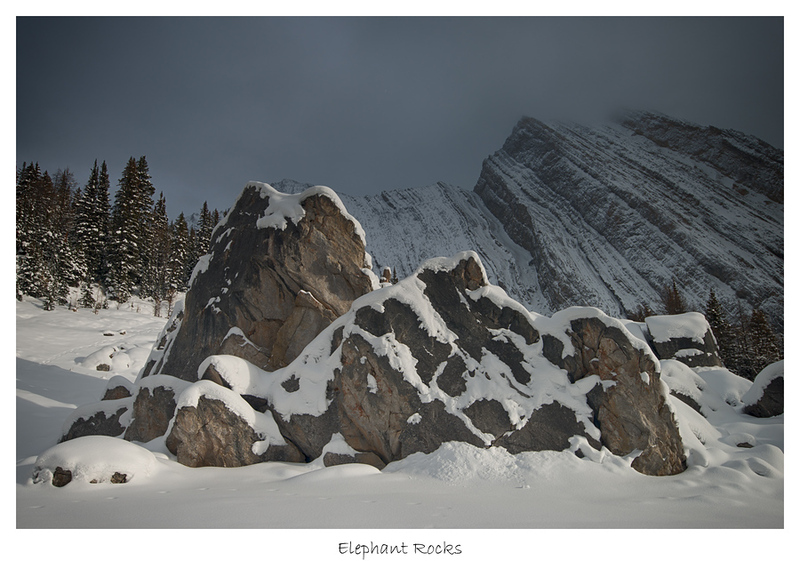 I`ve read about the 'elephant rocks' at Chester lake but haven't seen them and didn't really know where they were. I was sort of hoping that the trail would lead to them so I followed the tracks up into the trees. After about 20 minutes or so the trail entered a clearing and this was where the rocks were.. They weren't really rocks per-say but were large (very large, like two story house large) hunks of rock there were scattered around the clearing. I was excited to find them so I started to make some photos. As I worked my way around the rocks making different shots I found myself waiting for the sun to dip below the clouds so the light would hit the rocks. It did it once or twice while I wasn't really paying attention so I figured it would do it again. I was standing there waiting, looking at the rocks, forming my composition so that when the light came I'd be ready to make the shot. While I was waiting for the light I was looking at the rock formations when all of a sudden it clicked and I saw them. The elephants. In the photo below I see two. I made some shots and waited around some more to see if the clouds would let the sun out again but they did not so I moved on and made my way back down to the lake. Walking downhill was easier so I made good time. Past the lake and down down down to the parking lot. When I got there there were about nine cars and there were two moose left licking the cars. I circled around so as not to get too close but ended up herding them towards my car. I used my remote lock to make the horn beep and scare them off a little bit so I could get access to my car. After unpacking and changing out of my sweaty clothes I started my drive back to Calgary. It was just after four in the afternoon. Sun was to set at 5:00pm but it was already darker because of the clouds. 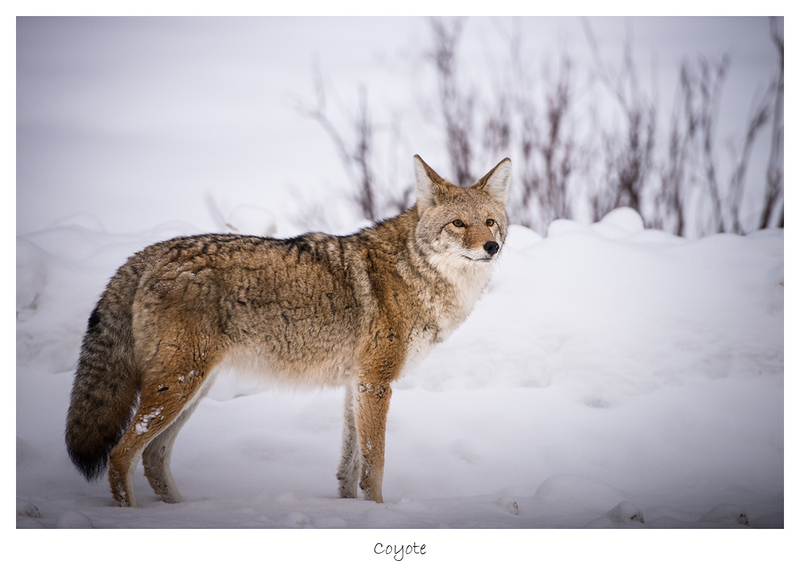 Heading back towards Canmore I saw a coyote and a large bull moose on the side of the road. I stopped to make some photos of both. Overall, it was an awesome day in the mountains. There are more photos from today posted and you can see them here.